Descendants of the Earl of Sandwich opened a sandwich concession on the Boston Common late last Autumn. Spending a considerable amount of money, an old "comfort station" i.e. 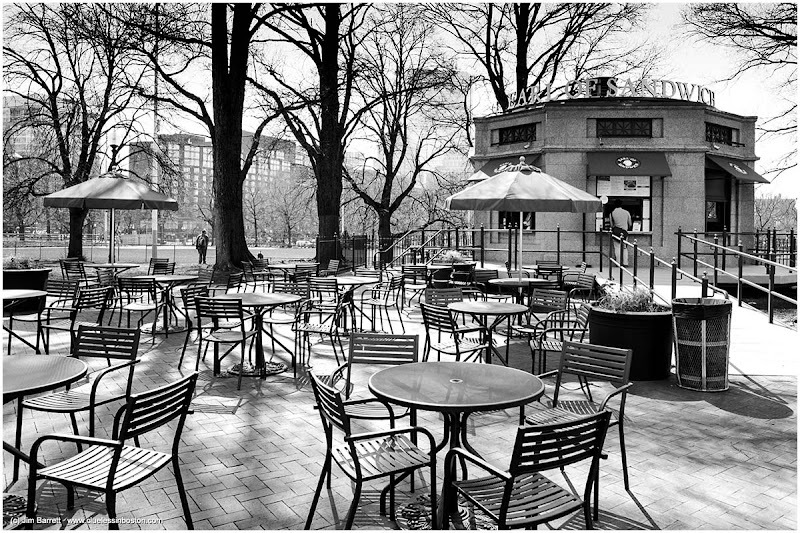 restroom, near the Parkman Bandstand was converted into a restaurant. I haven't stopped by for a sandwich yet, just a few pictures and a menu. You can read more about the restaurant in the Boston Globe. I bet it will be heaving with customers come spring and summer; I predict a 'money-spinner'. Like John, I think that the place will be soon plenty of customers to enjoy the place! Ooooh, you've changed your blog layout! It looks really good and really brings out your photographs. I like this photo and especially like the subject. Some of my favourite moments are spent enjoying park cafes and outdoor seating.